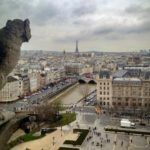 You’re planning a trip to Paris and would love to include a Normandy itinerary in your travel plans. You’d like to visit Normandy towns like Bayeux, walk in the footsteps of WWII history, and even spend a day at the spectacular Mont Saint-Michel. 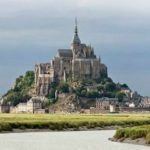 In this Normandy and Bayeux travel guide, you’ll find all the information and tips you need to plan your Normandy itinerary. The region of Normandy is to the northwest of Paris, on the coastline along the English Channel. The town of Bayeux makes a great base while exploring the region, not to mention has historical sights and attractions all its own. This small, popular town is central for exploring and reliving Normandy’s World War II history. 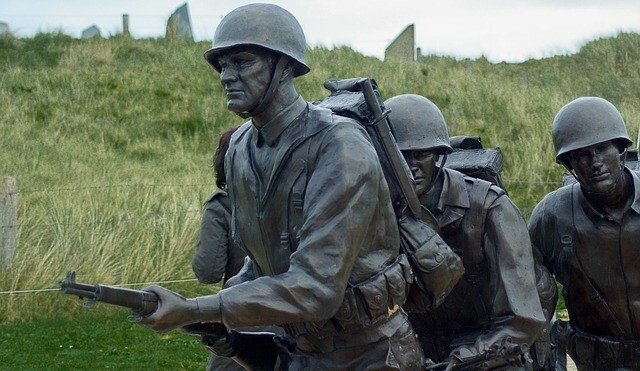 It’s close to the D-Day Beaches, WWII battle sights, memorials, and cemeteries. Bayeux is also home to the impressive Bayeux Tapestries showing the Norman conquest of England and is just 1 ½ hour drive to Mont Saint-Michel. Despite being just 4 miles from the English Channel, Paris to Bayeux by train is easy. 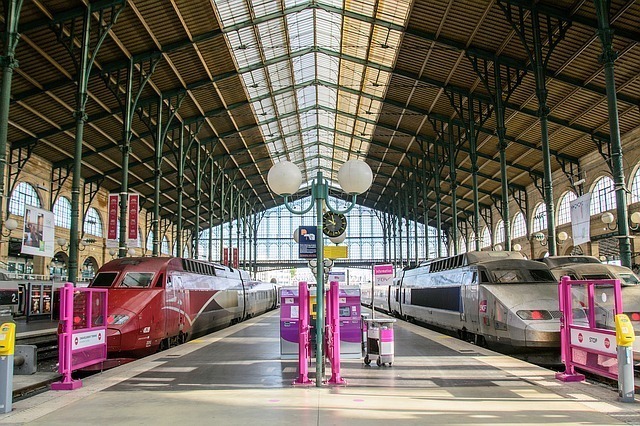 Trains from Gare Saint Lazare are an easy 2-hour ride from Paris to Bayeux. Depending on the time of day, there are direct trains or routes with a simple connection through Caen. 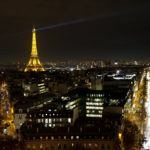 Book tickets directly with France’s rail service to save money. An early morning train from Paris lets you see the French countryside as the sun comes up while giving you a full day in Normandy. Trains back to Paris run late allowing you to leave Normandy at the end of a day. Bayeux’s train station is a 5-minute walk to the pedestrian-friendly main road which runs through town. There are usually a few taxis available at the station to bring you into town. It’s worth checking the location of your hotel in relation to the train station. In my case, the hotel was just 5 minutes away on foot so a taxi wasn’t necessary. If you’re returning to Paris after Normandy and staying in the same Paris hotel, ask your hotel to store bags and items you don’t need for the few days in Normandy. 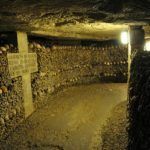 By packing a small bag just for Bayeux and storing the rest in Paris, the walk from the train station was even easier! Le Lion d’Or is centrally located along Bayeux’s main road but set back off the road via a pretty courtyard. 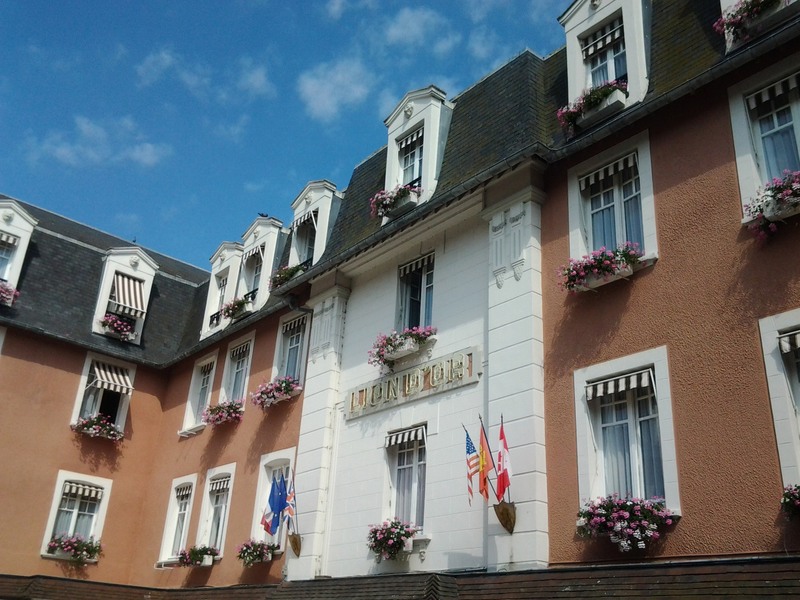 It’s consistently ranked as a top Bayeux hotel and has received a Certificate of Excellence from TripAdvisor. The hotel is situated in an 18th-Century coach house with 31 rooms, a restaurant, and a bar. The rooms are comfortable with a modern design and come in a range of sizes from a standard room to a family suite. The hotel serves breakfast which is perfect for starting your day. The location of Le Lion d’Or can’t be beaten! You can easily walk from the hotel to the Bayeux Tapestry Museum, the Cathedral, and the Saturday market in town. It’s also central for a pick-up if you’re planning to do a Normandy WWII or Mont Saint-Michel tour. Not to mention the Le Lion d’Or is steeped in history! Many notable politicians, actors, and artists have stayed at the hotel or enjoyed a drink from the bar during their time in Bayeux. Perhaps you’ll sit or stay where President Eisenhower, Earnest Hemmingway, Prince Charles, Tom Hanks, or Steven Speilberg did! In general, the best places to stay in Normandy will undoubtedly come with an excellent location making it easy to see many things in a short period of time. 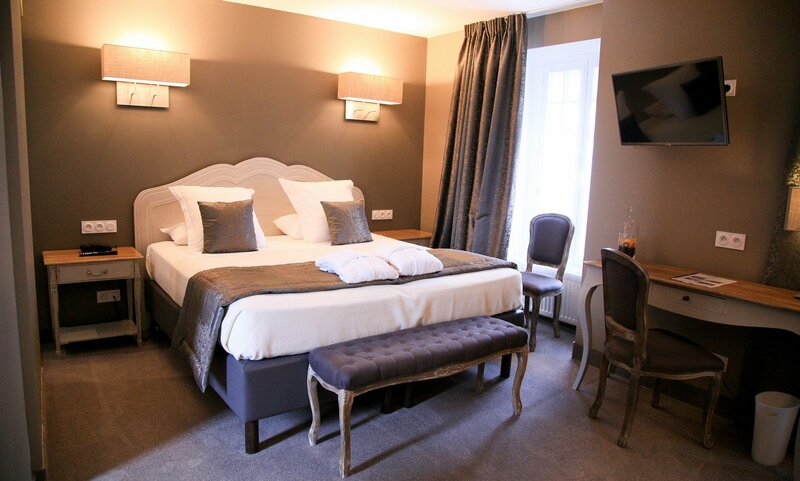 Hotels in Bayeux, like Le Lion d’Or, are so convenient because the town is small and everything is walkable. The Bayeux Tapestry Museum displays the Bayeux tapestry showing the Norman conquest of England and is a MUST-SEE. The tapestry is over 1000 years old and recognized by UNESCO. It’s 230 feet long and 20 inches tall and thought to have been embroidered around the year 1070. Even if you’re the most passionate of WWII history buffs and are anxious to get to the landing beaches in Normandy, you’ll want to save an hour or so for visiting the Bayeux Tapestry. What is the Bayeux Tapestry, you ask? 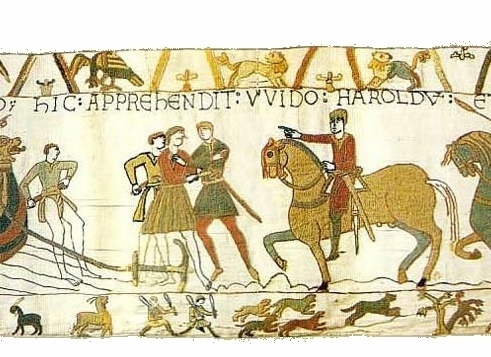 The Bayeux Tapestry shows 50 scenes showing of the events leading up to the Norman conquest. 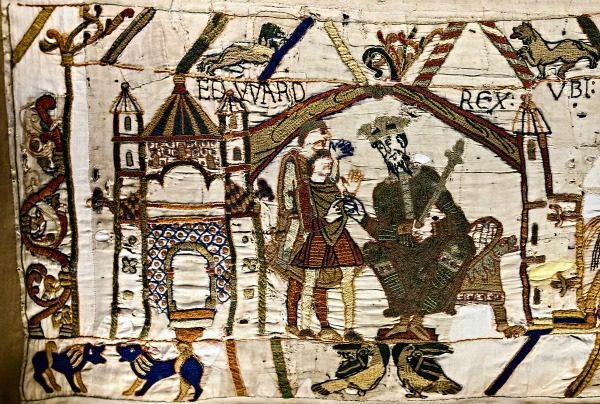 It tells the story of King Edward of England sending Harold, Earl of Wessex, to Normandy to inform William (the Conqueror) that the King has chosen him to succeed him upon his death. But, when King Edward dies, Harold takes over the throne, forcing William to battle for his right to be King. The tapestry culminates with the Battle of Hastings in 1066. The Bayeux Tapestry Museum offers audio guides, which explain the scenes on the tapestry. Be sure to take advantage of this because it’s really well-done and tells the complete story of the conquest. Back in medieval times, the tapestry was rolled out a couple times a year to teach people the history of the Norman conquest. The history is fascinating, not to mention learning in the same way people did so long ago. You’ll leave the museum behind wishing there were more tapestries to see! 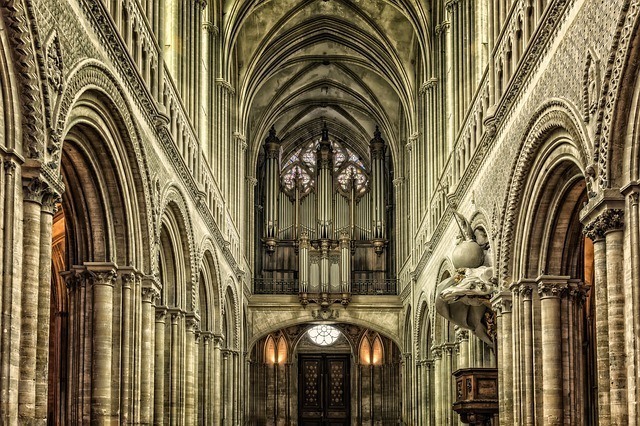 Visit the Cathédrale Notre-Dame de Bayeux. The Cathedral opened in 1077 and was the first home to the Bayeux Tapestry. The cathedral towers over all the other buildings around it. It’s one thing to see a big, gorgeous Cathedral in a big city like Paris, but when you see one in a small town like Bayeux, it shows how powerful the church was hundreds of years ago. The Cathedral in Bayeux is a great example of this. You can see why people living during medieval times would have felt both fearful of and protected by God and the priests serving on his behalf. Walk Bayeux’s open-air market. Every Saturday along the main road through Bayeux vendors sell fresh fish, produce, bottles of Calvados (an apple brandy produced in the region), housewares, clothes, and souvenirs. Walking through markets like these, the food always looks so fresh! 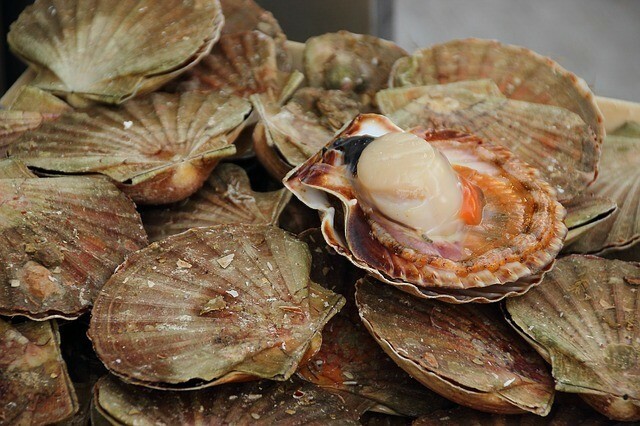 Scallops are a local Normandy specialty. If they’re in season when you visit, make sure to try some. I’ve yet to taste any better! 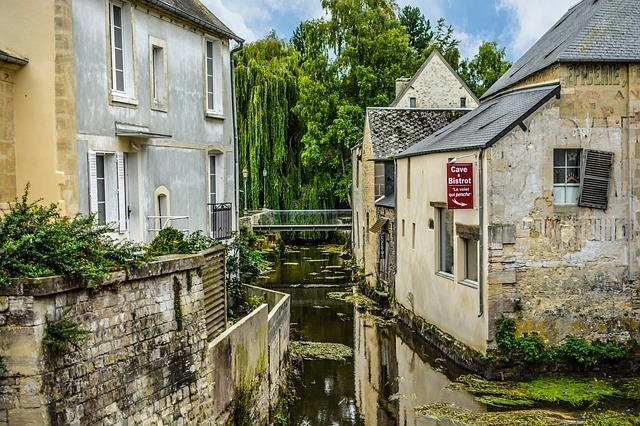 Whether strolling through the market on Rue Saint-Jean or Rue Saint-Patrice, be sure to take a break and veer off to walk along Bayeux’s canal and see the water wheel and the waterfall it creates. The American Cemetery looks out over Omaha Beach. The French gave this land to the United States for their help during WWII. When you’re on this land, you are technically on American soil. 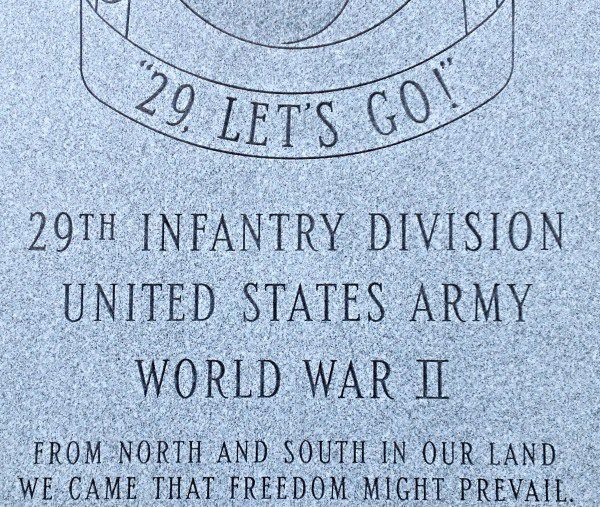 Undoubtedly, you’ve come to visit the D-Day beaches in Normandy, Pont-du-Hoc, the American Cemetery, the D-Day museum, and the countless other WWII memorials. 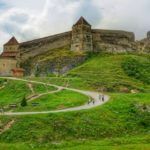 While you could rent a car and self-drive to these sights, you’d most definitely miss out on a ton of incredible information. 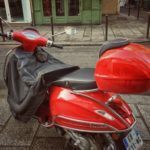 The best Normandy tours are typically led by a beyond knowledgeable local who will pick you up and drop you off at your hotel after a full day. 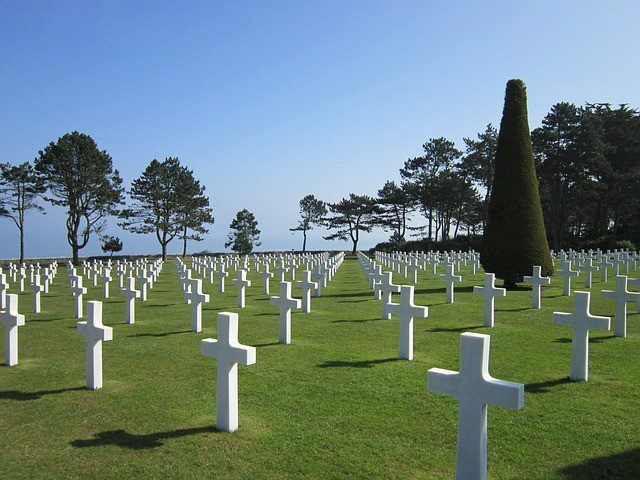 You can visit D-Day beaches, famous battlefields, memorials, cemeteries and more. 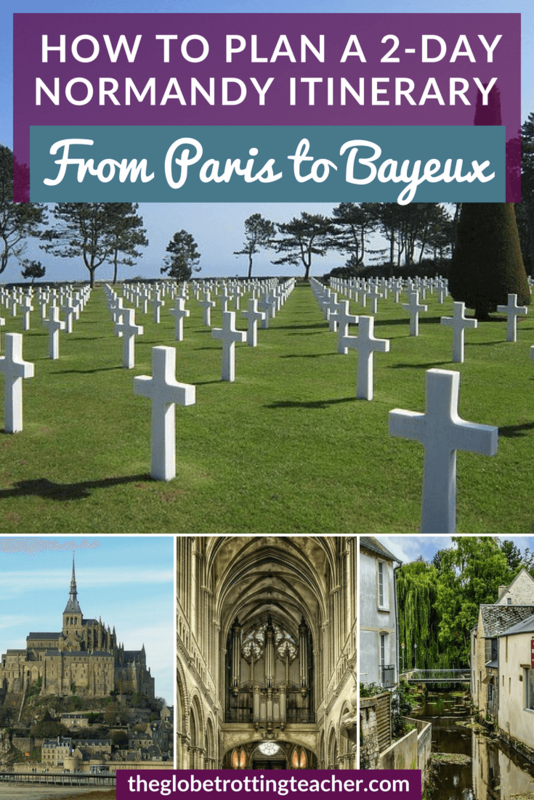 Oftentimes, these guides and their families have lived in Normandy for generations and can weave in anecdotal WWII stories passed down from their relatives that can’t be found in any history book. Their personal WWII history perspective can offer nuances that’ll build layers to your understanding of the time period. D-Day tours in Normandy range in length depending on your interest level. There are half day tours and all kinds of Normandy tours to fit your timing and what you’d like to see. As you tour the area, you can’t help but be struck by the memorials and memorabilia left to honor the sacrifices made by the armed services of many countries. There are many Normandy houses flying not only French Flags, but also British, American, and Canadian flags too. The people of Normandy understand and greatly appreciate how their allies helped them fight for freedom. A visit to Normandy is not only heartfelt but also highlights one of the biggest benefits of travel. First-hand experiences bring history to life and create a connection with the past that is far more meaningful than learning about it in a classroom. Another benefit of a visit to Normandy is how close you’ll be to Mont Saint-Michel. This UNESCO World Heritage Site is one of the most visited places in France and worldwide. This medieval town with the Abbey of Saint-Michel sits on a rocky island surrounded by the tides of the Atlantic. Dating back to the 8th Century, Mont Saint-Michel is the place where St. Michael told the Bishop of Avranches to build a church back in the year 708. Mont Saint-Michel became a place for pilgrims to come soon thereafter. From your hotel in Bayeux, Mont Saint-Michel will be just 1 ½ hours by car. You could rent a car but for a 2 or 3-day getaway from Paris, I’d recommend keeping it simple and going with a Mont Saint-Michel guide. Not only will the guide’s information be useful, you won’t have to worry about navigating the area. Especially in late spring and summer, Mont Saint-Michel can be quite busy and someone who knows the area will make the day that much better. 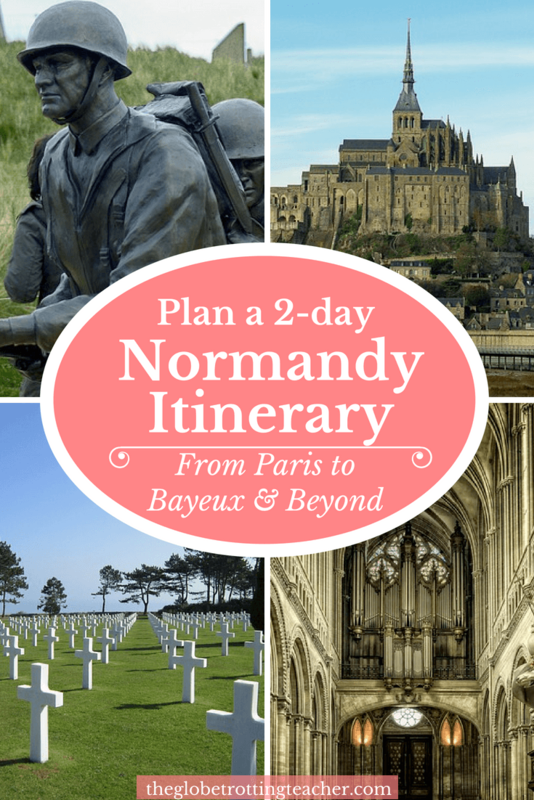 Prefer a Paris to Normandy day trip or a guided Normandy tour instead? Whether you visit on your own or with a guide, it’s important to use the footbridge to get to the island and pay attention to all information about the tides. 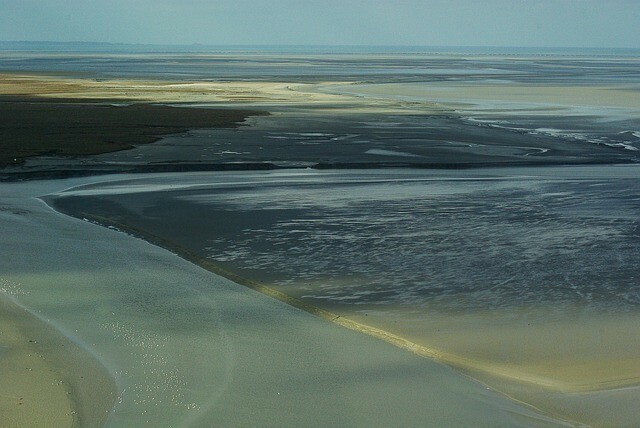 The currents can be particularly powerful and even at low tide, the mudflats can act like quicksand. Once you’ve made it onto the island and into the town, you’ll be instantly transported back hundreds of years. The medieval town spirals up to the Abbey. And along the way, you can imagine a butcher shop, a farmer selling their goods, and a cobbler repairing shoes. Don’t forget to visit the mont’s ramparts for sweeping ocean views. 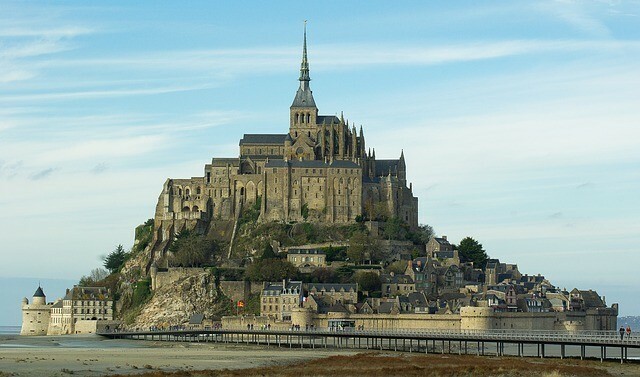 If you’ve taken the time to come to Normandy, a Mont Saint-Michel trip is a must! Is a Day Trip from Paris to Normandy Enough Time? It isn’t if you want to explore WWII sights and visit Mont Saint-Michel. Getting around the area, especially with a knowledgeable guide, can be done in 2 days, though. 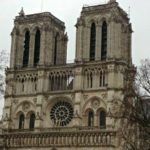 For example, you could take an early morning train from Paris, spend the first day doing a Normandy WWII tour, visit Mont Saint-Michel with a guide on the second day, and leave on the last train back to Paris that night. If possible, I’d recommend spending 2 nights. You could use the example above and use even half a day’s worth of extra time to visit the Bayeux Tapestry and explore the town a bit. If you’d like to spend time in Bayeux and some of the neighboring towns and/or do extended D-Day tours, plan to stay longer than 2 nights. The most popular times to visit Bayeux and Normandy are during the late spring and summer months. This will also be the busiest so it’s important to book hotels and tours early, as well as go with a smile to manage the crowds. Traveling during the off-season comes with definite advantages. Tours have few if any people on them. How nice to pay for a tour only to have a private guide! 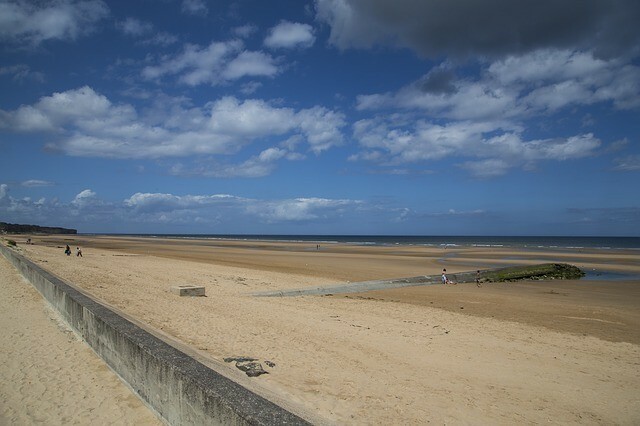 Hotels and train tickets are also readily available making it possible to plan a last-minute trip to Normandy. Even on a chilly, but sunny 45-50F degree day, you can comfortably see as much WWII history as your heart desires, as well as have Mont Saint-Michel nearly to yourself! Whether you’re visiting France for the first time or you’re a Francophile who loves getting off-the-beaten-path in Paris, take the time to visit Bayeux and explore Normandy. Would you like to visit Bayeux France and the region of Normandy? 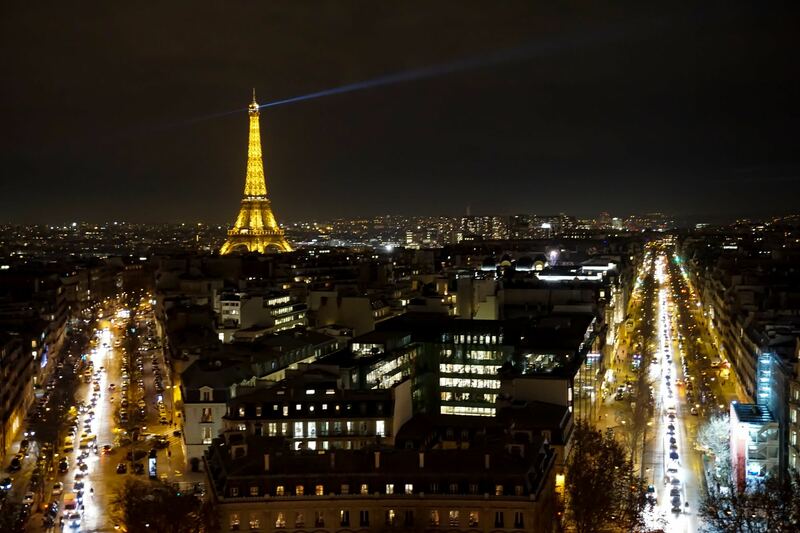 Thanks Jackie , I was able to find the train I was looking for…do you feel that iurchasing a Paris Pass is worth it? Thanks for reading, Francine. 🙂 I absolutely recommend the Paris Pass if you’re going to do a lot of Paris sightseeing. It’ll work out cheaper than buying tickets individually. But, always do the math to make sure what you want to see and do would be more than the pass. Also, remember the skip the line/fast track entrance can be a real time saver. Hi Jackie we are planing to go and visit Normandy. We have two days. Saturday May 23, and Sunday 24. 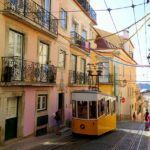 Could you help us plan our trip. We need a guide for the two days and private transportation. Hi Patricia, Thanks so much for reading the blog. Normandy is amazing. You’re sure to love it. 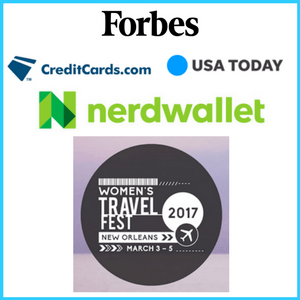 Unfortunately, I can’t/don’t book individual travel plans for readers. I’m not a travel agent and without that license, I’m unable to. Normandy Sightseeing provided us a great guide. I’d start there to see if they have availability. Enjoy Normandy! We were just in Normandy few days ago & used Johann through Airbnb—he was a great host, knowledgeable, personable & courteous…We also went to Mont St Michel -we booked the shuttle that leaves from the Churchill Hotel-highly recommend…Bayeux is a beautiful town…Enjoy! Thanks for reading and for the tips, Francine! Bayeux is lovely. Glad you enjoyed Normandy. Jackie, I appreciated your tips about the the train…Travelong to and from Normandy was quite pleasant.